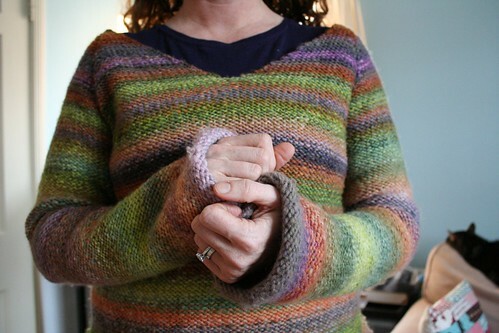 flipside :: handspun Saturday Sweatshirt Sweater, originally uploaded by earthchick. A conversation on the Hello Yarn forum about whether a particular sweater-in-progress would look better with the stockinette side out or the reverse stockinette side got me thinking. 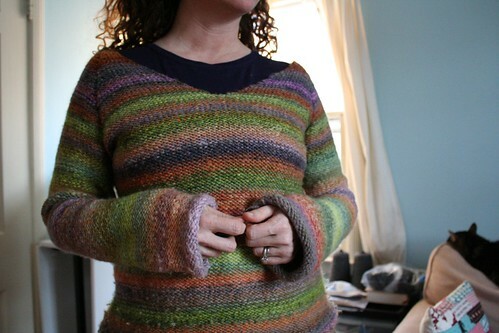 I realized that this pullover, my first (and so far only) adult-sized sweater from my own handspun (Hello Yarn Polwarth, “Cauldron”) could actually be reversible. So I tried it out – and I love it! I wear this sweater many Saturdays during the fall and winter. It is so cozy and comfy – and warm without being bulky. It’s pretty pilly, but I don’t care. I love it. And all the more so now that I realize it’s reversible. I love this sweater – just love it. I love reverse stockinette! The sweater looks fabulous!